Money Origami Set: Learn to create 21 origami designs using only money. If you've got a dollar in your pocket, you can stop boredom in its tracks. No, we're not talking about penny slots. We're talking about Money Origami! With this instructional gift set, you'll learn how to fold dollar bills into 21 fun and interesting designs. The Money Origami Kit includes a 64-page book that features easy-to-follow color illustrations. It is accompanied by a two-hour instructional DVD hosted by the authors of the book as they demonstrate their money folding designs step-by-step. So, whether you prefer learning from a book or from a video, the Money Origami Set has you covered. To help you learn how to fold money into airplanes, butterflies, stars, cubes, boxes, serpents, napkin rings, and more, a set of 60 practice dollars is included. Note: "Practice dollars" means fake dollars. Dimensions: 8.5" x 8.5" x 1.25"
Traditional origami is performed with square sheets of paper. But, since most of us don't walk around with square-shaped currency in our pockets, the architects of the Money Origami Kit had to come up with designs tailored to US currency. What you'll find in the Money Origami Kit is a wonderful collection of sculptures with something for everyone. Use this kit to learn a new hobby, kill a little boredom, and discover a creative way to give money as a gift. 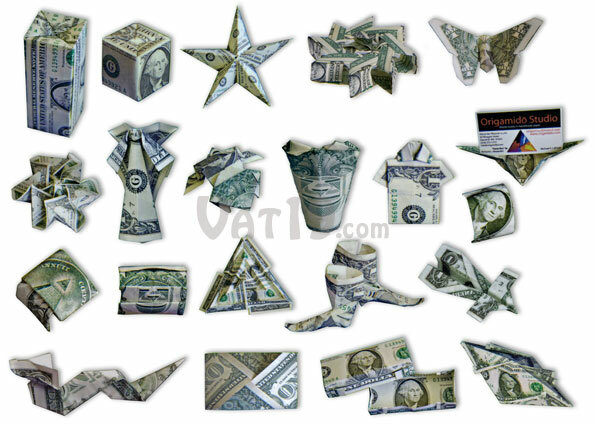 Make the most of your dollar bills with the Money Origami Set. With the Money Origami Set, you can learn to create the twenty-one origami designs pictured below. The designs range from fairly simple to challenging. Both beginners and experienced folders will enjoy this kit. Four-dollar tall box, cube box with lid, five-pointed five-dollar star, wheel of fortune, dollar bill butterfly, thistle, angel ornament, jumping frog (with eyes), Mr. Bill Green, stand-up shirt, George napkin ring, business card holder, "eye" ring, monkey face ring, three-dollar step pyramid, Haverhill high-top shoe, duckbill plane, Chinese dragon/sea serpent, x-wallet, rectangular box with lid, and lighting bolt favor. 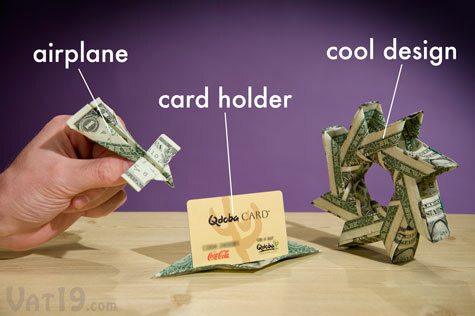 You'll learn to fold the 21 origami designs pictured above with the Money Origami Kit. 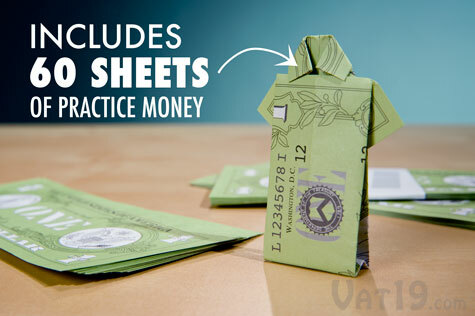 The Money Origami Kit includes sixty practice dollar bills. While you could use them to hone your "making-it-rain" skills, their primary purpose is to help you master the money folding techniques outlined in the kit. Practice your folding with the sixty "counterfeit" bills. At Vat19.com, we're visual learners. 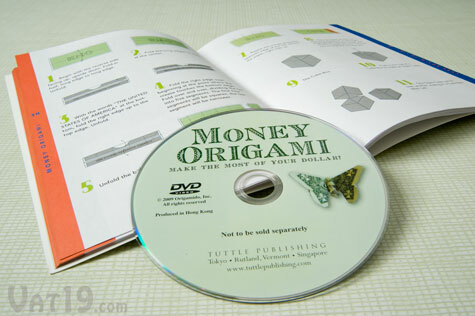 So, we love that there is a DVD included in the Money Origami Kit. We found it easy to learn the designs by watching the two authors (Michael Lafosse and Richard Alexander) perform step-by-step demonstrations of each design. Alternatively, you can reference the 64-page booklet which includes detailed instructions and diagrams for each of the 21 origami sculptures. 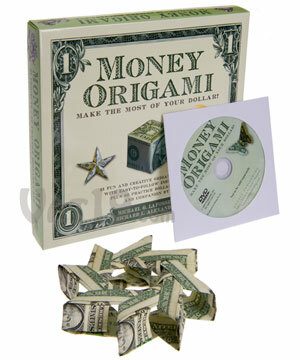 The Money Origami Kit includes both an illustrated booklet and instructional DVD.